For a hatchet job to be truly satisfying, a number of conditions have to be met. First, you need an established critic – someone whose taste and judgement have earned her the respect and trust of her readers. Next, a seasoned, successful (perhaps, slightly overrated) author – one who, if he’s still in the game, and prospering, has had his fair share of good and bad reviews, and can take the hit. Ideally, the book will be highly anticipated; even better if there’s expectation of its success; and if the book has garnered a series of gushing reviews well-nigh canonizing the author, then perfect. Cue Michiko Kakutani on John Updike. Authorial hubris is another motive for a gory hatchet job. In 2013, Morrissey, lead singer of The Smiths, released his autobiography, titled, appropriately, Autobiography. Controversially, Morrissey leveraged his considerable fame to force the publisher to release his book under the Penguin Classics imprint. Enter A.A. Gill, who, in a devastating review, described Morrissey’s behaviour as a ‘pooterishly embarrassing piece of intellectual social climbing’, and the book as ‘a cacophony of jangling, misheard and misused words . . . a sea of Stygian self-justification and stilted self-conscious prose’. Gill’s essay won the Hatchet Job of the Year Award, a prize in which the winning critic is presented with a cardboard hatchet – a symbol of the critic’s ability to hack an author’s self-worth to pieces. Given the hype and circumstance of today’s publishing world, we rely on a cohort of disinterested critics to separate the wheat from the pulp. But to paraphrase the Roman poet Juvenal: who will critique the critics? The answer: other critics. While Renata Adler and Pauline Kael were both working as film critics for the New Yorker, Adler published a brutal takedown of her colleague in the New York Review of Books, portraying Kael as a bullying demagogue lost in the funhouse of her own cult following. Kael’s ‘prose hypochondria’ is ‘the spectacle of the staff critic as celebrity in frenzy’. The diatribe goes on for 8,000 words. If you are an artist and your work has been unfavourably received, console yourself with the knowledge that even the most immortal of writers have been subjected to harsh condemnation. John Keats faced vile criticism of his 1818 poem Endymion. John Wilson Croker ‘made efforts almost as superhuman as the story itself appears to be, to get through it’, doubting that ‘any man in his senses would put his real name to such a rhapsody’. Keats died three years later. 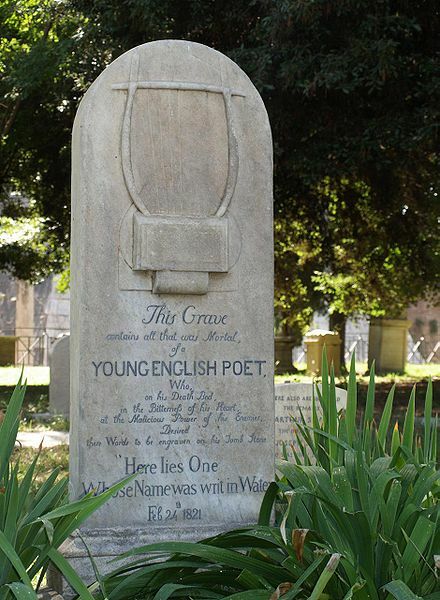 His headstone reads: ‘This Grave contains all that was mortal, of a young english poet, Who, on his Death Bed, in the Bitterness of his heart, at the Malicious Power of his Enemies, Desired these Words to be engraven on his Tomb Stone: Here lies One Whose Name was writ in Water’. The grave of John Keats, the Protestant Cemetery, Rome. At Granta we rarely publish hatchet jobs. That said, Matthew Rohrer’s poetic takedown of the planet Mars is pretty scathing: ‘Mars is a stupid planet. Going there / is stupid . . . / you people are assholes throwing away / money we need here’. Who has been nominated for the The Women’s Prize 2018 longlist? The poetry world is abuzz this week in the wake of a controversial essay published in PN Review by British poet Rebecca Watts, denigrating a new generation of ‘amateur’ poets.